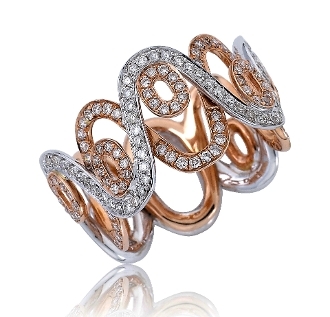 This elegant ring boasts a romantic rose, and glamorous white 14 Karat gold infinty shaped waves swirling in and out, over and under each other with a total of 105 brilliant round cut Pave Diamonds, equivalent to a total carat weight of 0.80 this designer ring is sure to turn heads. The magnificent three-dimensional comes alive with 5 Pave Diamond O’s, set with 10 round cut Diamonds each. In total you will dazzle her with 155 brilliant Diamonds! For added appeal personalize your item, select our Engrave option and indicate size needed when adding to Cart.